Congrats on the pub!! I loveeeeeeeeeeee this!!! LOVING the colors and the pie!! Congratulations, Lisa! It's gorgeous! I didn't get pumpkin pie this year, so now I'm going to be craving it. LOL Have a great day! this is so adorable!! great job!! i can't wait to see what you make with your turkey on the shelf!!! a mini would be awesome!!! i know whatever you decide will be awesome!! That is so, so, so cute! Love the little pie piece and bingo card. Perfect :) Congrats on the pub! so cute, love the bingo card!!! Super cute card. Congrats on the pub. I agree with MP. You should do a mini album with all the Gallop pics! Can we go back to last week and have pumpkin pie again!!! 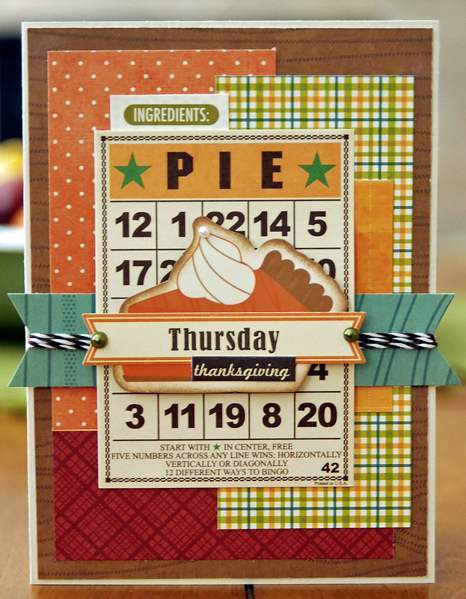 Such a fun mix of colors and patterns - beautiful card! Great use of layers! That pie piece is perfect! Congratulations...you must be so proud! Hey, I chatting to acard celeb! Congrats on the pub! So deserved - that is a gorgeous card!